This section describes how to create a cluster using the advanced setup procedure in the Altus Director UI. For the simple setup procedure, see Simple Setup: Creating a Cluster on AWS with Default Settings. Note: The lifecycle of instances and clusters depends on the availability of external repositories (for example, the Cloudera Manager repository). If these repositories are unreachable during this lifecycle, Altus Director cannot grow the cluster, for example, and a grow operation results in a Modify failed state until the repository is available again. To ensure that there is no point of failure during cluster growth, you can preload the AMIs you use with Cloudera Manager and CDH. For more information, see Using Custom Repositories with Cloudera Manager and CDH. Note: In most AWS regions, Altus Director assigns a tag during the creation of each instance it creates to facilitate instance management. The GovCloud (US) and China (Beijing) regions do not support tagging of instances on creation, so for instances in these regions, the tag is created after the instance is created. If you are running Altus Director in the GovCloud (US) or China (Beijing) regions, you must turn off useTagOnCreate in the Altus Director AWS plugin. 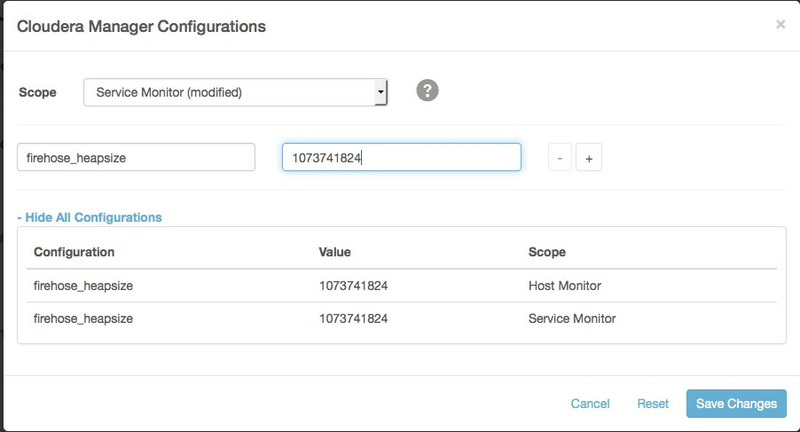 See Configuring Tag-on-create for AWS GovCloud (US) and China (Beijing) Regions in the Troubleshooting section for detailed instructions. Add an Altus Director environment, as described in Adding an Altus Director Environment on AWS. This opens a wizard for adding an environment, Cloudera Manager, and a CDH cluster. In the Instance Template field, click Select a Template if you already have one that you want to use, otherwise, click Create New Instance Template. The Create New Instance Template modal screen displays. In the Instance type field, select m4.large or m4.xlarge. In the Image (AMI) ID field, enter the ID for the Amazon machine image (AMI) you chose in Launching an EC2 Instance for Altus Director, or find another AMI with a supported operating system. Note: To reduce cluster bootstrap times, you can preload the AMIs you use with Cloudera Manager and CDH. For more information, see Using Custom Repositories with Cloudera Manager and CDH. Note: Altus Director uses the Name field on AWS. By default, Altus Director puts the following values in the Name field: Altus Director id, Altus Director template name. If you want to create a custom key value for this field in place of "Name," see Configuring Altus Director to Use Custom Tag Names on AWS. In the Security group IDs field, enter the security group ID you set up in Creating a New Security Group. In the VPC subnet ID field, enter the ID of the VPC subnet that was created during VPC setup. Click Advanced Options if you want to specify additional values for optional features, such as EBS, IAM, Spot instances, Auto Scaling groups, and AWS user data. Note: With Altus Director 2.4 and higher, you can enter opaque data or scripts in the User data field of the instance template, and this data will be passed to the instances as they are launched, using the EC2 user data mechanism. Note that AWS requires user data to be base64-encoded. You must perform the base64-encoding manually. For more information, including examples, see Instance Metadata and User Data in the AWS documentation. Cloudera Enterprise: includes the core CDH services (HDFS, Hive, Hue, MapReduce, Oozie, Sqoop 1, YARN, and ZooKeeper) and, depending on the license edition, one or more additional services (Accumulo, HBase, Impala, Navigator, Solr, Spark). For more information on Cloudera Enterprise licenses, see Managing Licenses in the Cloudera Manager documentation. Cloudera Enterprise Trial: a 60-day trial license that includes all CDH services. Cloudera Express: no license required. In the Desired License Type field, select Cloudera Enterprise. In the License Key field, either select a Cloudera Enterprise license file to upload or select Direct Input and input the license file text directly into the text area. To enable usage-based billing, enter the billing ID provided to you by Cloudera in the Billing ID field. In the Repository URL field, enter the repository URL for the version of Cloudera Manager to install. Repository URLs for versions of Cloudera Manager 5 have the form https://archive.cloudera.com/cm5/ followed by the operating system, operating system major version, processor architecture, cm (for Cloudera Manager), and the Cloudera Manager major, minor, and (if applicable) maintenance release number. For example, the repository URL for Cloudera Manager 5.5.4 on any supported version of RHEL 7 is https://archive.cloudera.com/cm5/redhat/7/x86_64/cm/5.5.4/. In the Repository Key URL field, enter the URL for the repository key. Repository key URLs have the same form as repository URLs except they end with the name of the key file instead of the Cloudera Manager version. For example, the repository key URL for any version of Cloudera Manager 5 on any supported version of RHEL 7 is https://archive.cloudera.com/cm5/redhat/7/x86_64/cm/RPM-GPG-KEY-cloudera. Enter the repository parcel URL for the version of CDH you want to install. Parcel URLs for versions of CDH 5 have the form https://archive.cloudera.com/cdh5/parcels/, followed by the major, minor, and (if applicable) maintenance release number. For example, the URL for CDH 5.4.8 is https://archive.cloudera.com/cdh5/parcels/5.4.8. In the Instance groups area, choose an existing instance template or create a new one, either for the all instance groups in the cluster, or for each group. For each instance group, indicate the number of instances you want. Note: To reduce cluster bootstrap times, you can preload the AMIs you use for your cluster instance groups. For more information, see Using Custom Repositories with Cloudera Manager and CDH. In the Create New Instance Template modal screen, click Advanced Options. In the Spot bid (USD/hr) field, enter your Spot bid price. Click the Use Spot instances checkbox.